As of Tuesday, March 26, you can now Pre-order Transitions for the May 24 release date right on Bandcamp! "Now the band has announced their second album Transitions, which is going to be unleashed on the world in late May. These ten new tracks are preceded by the seductive, dark, and intensely beautiful single “Soul Alive”, which sounds like it was created especially for a film like Strange Days. It is totally possible to imagine Ralph Fiennes falling into the groove on this track while engaging in some trippy virtual reality. The Big Takeover is supremely pleased to host the premiere of this richly and deliciously atmospheric noir track. Spectral synths expand into the void while a peppering percussive churn keeps the dazed-dreamy feeling from totally disappearing into the ether. April Love’s dispassionate to wistful vocals diffuse into this mesmerizing sonic split, at first rich and velvety and then airy and hovering. This music calls to mind such artists as Glass Candy, Ladytron, Crystal Castles, Metric, Le Tigre, and Phantogram. But you should not limit your expectations to these groups alone. Here you’ll find the future but in a way that pays homage to synth heroes of yesteryear. Clan of Xymox’s album Phoenix also makes for nice kinmanship with LUCKYANDLOVE." "Originally from Silver Lake, California, LUCKYANDLOVE formed in 2014, their name inspired by The Good Luck bar where April Love and Loren Luck first met in 2006. Jump forward a few years and 2019 is promising to be a big year for the duo, with a tour of the US starting March 30th and running throughout April and May and then onto the UK where they play London and Manchester. A new album, Transitions, is also on the horizon with a release date slated for May 24th. This new album promises a deeper, more darkly textural and multi-layered sound from their 2017 debut. 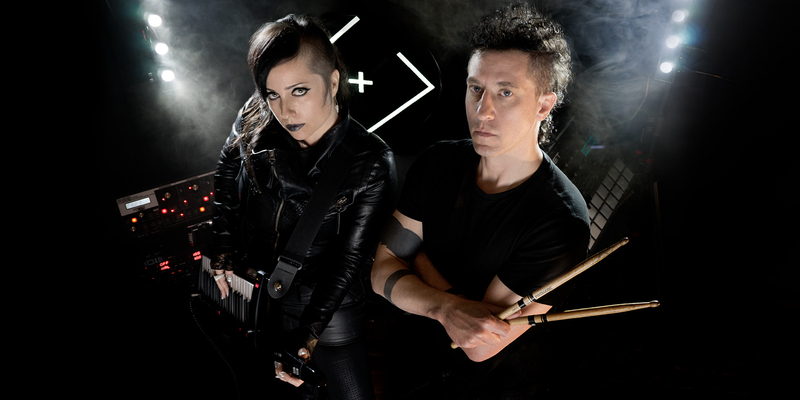 Going by the teasers, April and Loren have embraced the murkier elements of darkwave, infusing their sound with trippy ambiance and coiling electronics. April‘s voice is sultry and spectral, arcing in and out of the swept melodies and growling sinewaves." "will knock you off your feet"